You know, I think Fox News gets a bad and unfair rap as being dumb or being shills for the Republicans. 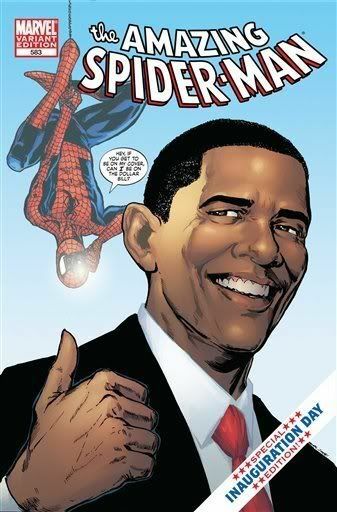 Captain Obama … Is It Time for a Black Comic Book Superhero? My, what an insightful and well-researched article! Clearly my entire mindset and view need to be changed because of this ground-breaking, hard-hitting journalism! 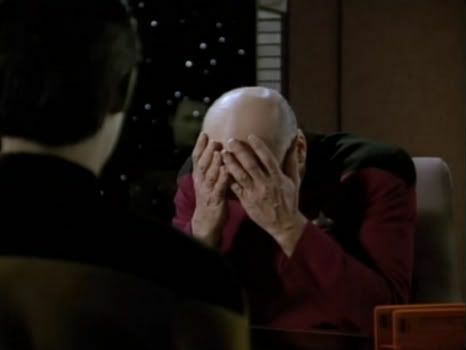 Captain Picard, what do you have to say about this? In the DCU alone, I can name Vixen, John Stewart Green Lantern, Cyborg, Black Lightning, Lightning, Thunder, Firestorm, Mr. Teriffic II, Amazing Man, Steeland Jakeem Thunder. And that’s just off the top of my head as characters who are currently featured in books. Yes, what we really want is what looks like a parody character who doesn’t even remotely look aesthetically-pleasing. SOME popularity? He’s got his own book (admittedly going over to a woman whose identity has not yet been revealed), was the starring feature of the second Ultimate Avengers animated film, and as the article says, is getting his own animated series soon. …Who the hell is Delete and what about Monica Rambeau, Thunder, Lightning, Steel II (not sure what she’s calling herself in Infinity Inc.), the Crimson Avenger II, Storm? Luke Cage has been a high-profile member of the Avengers for a few years now, plus at one point convinced the heroes of how they could do more help on a smaller-scale level, which certainly needs to be done from time to time. And he’s, you know, helped save the world. Plus how many times has John Stewart saved planets, just in his role as Green Lantern across the universe or as a member of the Justice League? I give the article credit to reaching out to independents, including the EXCELLENT artist and writer Spike of Templar, Arizona, but perhaps they should be addressing a FEW more mainstream creators. What about Dwayne McDuffie or Christopher Priest or Tony Isabella? Is there a lack of black superheroes? Possibly. Black creators? Most certainly. But if you’re not going to bother to do any real research on the subject or make false, blanket statements, then don’t even bother. The T-Force USED to be cool, but then they added in the T-midi-chlorians and it just got stupid. Hey, guys! It’s a little old (several videos have come out since the initial recording), but here’s the interview that Transmission Awesome, the official podcast of ThatGuyWithTheGlasses.com, has made that featured me! Enjoy! Ignore it. Ignore the hype. Ignore the fact that a President is on a cover (ZOMG, we’ve NEVER seen THAT before!). Ignore the fact that it’s Spider-Man meeting the new President. It’s a marketing gimmick. That’s all. And so far it’s worked perfectly. The fact of the matter is that this is nothing new. This is not some hot item that’ll be worth thousands of dollars in a few years. This thing is entering it’s THIRD PRINTING already. No one wants to spend millions of dollars on an item that isn’t rare. And you could have Jesus appear in the comic for all I care saying how much he loves Spider-Man, it WON’T undue him making a literal deal with the devil himself. So don’t buy it. Don’t try to recreate the Superman #75 debacle from the early 90s. Don’t support a book whose main protagonist supports solving your problems by negotiating with evil. EDIT: Because of a continual attempt at spamming, I’m closing comments on this one.